Purchase stands with or without full color printed graphics.There are many reasons why you should use display banners. The first reason - and most important one - is that a display banner can leave a great impression on your customers to show them that you can create a powerful design for your company while looking very professional as well. The second reason is that it is a great advertisement tool used to explain what your company is all about. Since it is printed on a large scale, our 79"x33.50" retractable banner for advertising agencies is great to use at an event so that people can see what types of products you are offering them at the tradeshow. 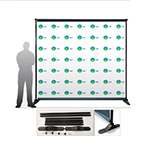 Also be sure to try our event back drop banner to use during the presentation of your products or services. Our design team can create a powerful and professional banner to fulfil your company's needs and successfully convey what you are trying to promote.Banner stands can display the product you’re selling to your customers or tell them how they can contact you. We offer wind plastic a frame signs which are easy to travel with as well as easy to assemble. You can include our indoor retractable banner stands in your restaurant to set up a vision of all those running promotions and deals you have to your customers. Our "79x33.5" retractable banner for restaurants is really popular and is used by many restaurants for both indoor and outdoor purposes. 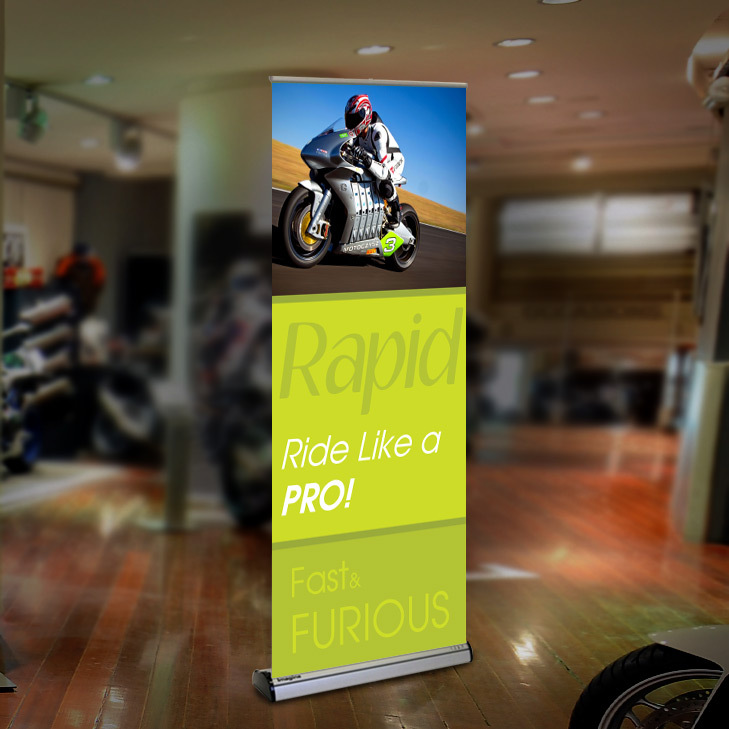 Our retractable banners stands are of high quality, rigid and made from the finest material. These retractable banners feature molded end plates and a three piece bungee corded pole. Our retractable banner stands are low cost and reliable. We use durable, long lasting 13 oz vinyl banner material for display stand. Banner advertising is very versatile. Design your banners in an attractive way, because banners advertising can do anything a website can do. Attract all the right attention with beautiful event banner displays. Use our most demanded 79"x39.37" retractable store banners to attract customers to a sale or clearance event, a book signing or celebrity appearance, a product launch, and more. 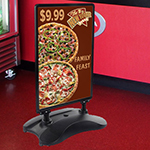 With indoor and outdoor options, you'll get an advertising display ideal for your location. Display banners make a dramatic impact in any location. When planning a trade show or presentation, you need an experienced trade show display company to help you identify your goals and find the best display solution for your event. Attract the attention of visitors to your trade show booth with a stylish trade show banner display that will help you to increase your customers. We will design a banner by keeping your product, logo, images, and colors in mind that truly describes your business in an easy way. They are also different types of outdoor stands to choose from such as feather banner stands, tear drop displays, Mamda outdoor stand, Mondo outdoor banner stand, splash outdoor stands, zephyr stands, zeppy stand, OBW banner wall, and Casita Canopy. These are a great way to attract customers to see your business while driving by. With our professional designer we will create a unique design that make you stand out. We have all kinds of display stands like aluminum snap frame, berty snap frame large and small, indoor sign displays heavy base indoor sign display, observe grand sign display, spring snap frame and rolling snap frame display. These are great tools to promote what you are selling to inform the customers on how much they need to buy the product. It can be used for trade shows inside your office or even outside your office or building. The banner display is strong! Thanks for such a great banner and display! product quality and great customer services! -- 63" 79" -- 23.62" 33.50" 39.37" 47.5"
We use durable, long lasting white 13oz vinyl banner material for display stand.it's indoor and out door meterial. 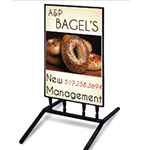 Your ultimate choice for a light weight, compact and convenient banner stand at an affordable price. Easy to install banner, just snap the aluminum profile to the top of the banner, then attach the bottom of the banner to the plastic leader with the adhesive strip. BADISSR23 Silver Retractable Banner Stand 23.625" x 63"
BADISSR33 Silver Retractable Banner Stand 33.5" x 79"
BADISSR39 Silver Retractable Banner Stand 39.375" x 79"
BADISSR47 Silver Retractable Banner Stand 47.25" x 79"
All Stand Carrying bag included.